ACTB / Beta Actin antibody was raised against aCTB recombinant protein. Maintain refrigerated at 2-8 degree C for up to 6 months. 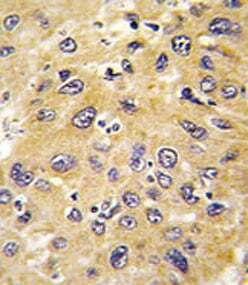 For long term storage store at -20 degree C.
Anti-Beta Actin antibody IHC of human spleen. Immunohistochemistry of formalin-fixed, paraffin-embedded tissue after heat-induced antigen retrieval. Antibody dilution 1:50. 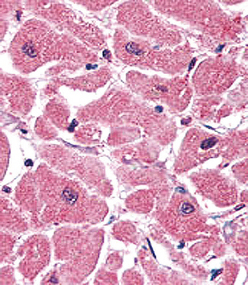 Formalin-fixed and paraffin-embedded human heart tissue reacted with Beta-actin Monoclonal Antibody, which was peroxidase-conjugated to the secondary antibody, followed by AEC staining. This data demonstrates the use of this antibody for immunohistochemistry; clinical relevance has not been evaluated. 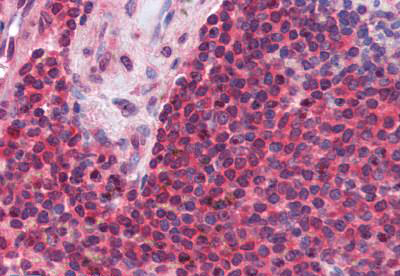 Formalin-fixed and paraffin-embedded human hepatocarcinoma tissue reacted with Beta-actin Monoclonal Antibody, which was peroxidase-conjugated to the secondary antibody, followed by DAB staining. This data demonstrates the use of this antibody for immunohistochemistry; clinical relevance has not been evaluated. Western blot of HL60 and Jurkat cell line lysates (35 ug/lane). Western blot analysis of anti-Beta-actin Monoclonal Antibody in HL-60 cell line lysates (35 ug/lane). Beta-actin (arrow) was detected using the purified Mab.